Peter Simmonds, from Kalgoorlie, Western Australia, is a keen collector of tektites. He has over 6000 australites in his collection including 11 buttons - Peter reports that it took him 17 years between finding his first 4 flanged buttons and his next 7! This shows just how rare the perfect button is. Most of Peters tektites come from the N. E. goldfields, 200 kms from Kalgoorlie. Peter was close friends with the late Bill Cleverly, whose valuable work will live on for a long time! He also has the Bill Cleverly collection of photos - many thousands. 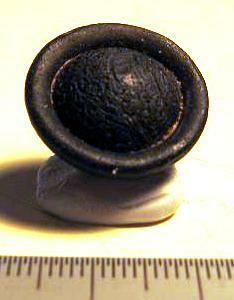 Western Australian buttons travelled around 5,400 km from the site of impact. The flanges on WA buttons are typically thinner than those from South Australia, which travelled around 1,000 km further. ABOVE: A flanged button. Peter found it in 2006 on Menangina Station, Western Australia. 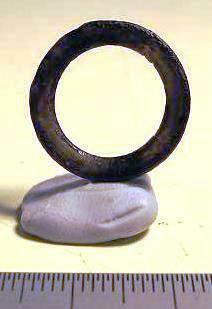 Weight 4.1g, Diameter 21 mm. Image copyright of Peter Simmonds. 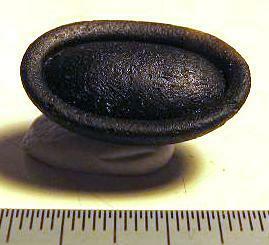 ABOVE: A flanged button, 4.3g, 22mm diameter, found at William Creek, South Australia. ABOVE: A 4.8g flanged narrow oval from Mt Remarkable Station, Western Australia. 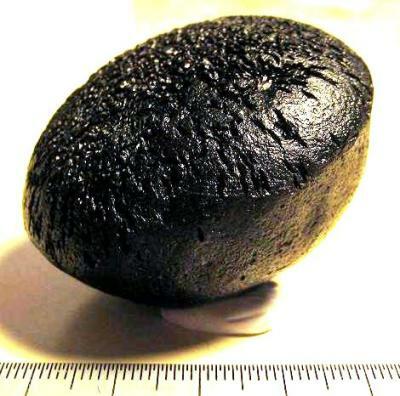 ABOVE: A 16.7g dumbbell core from Glenorn Station, Western Australia. ABOVE: This is a detached flange with a 20mm diameter. It was found at Glenorn Station, Western Australia. Many people find these highly collectable, as they are extremely rare - usually the flange breaks into two or more pieces. Radiating Anda-type scupture is usually located on the primary posterior surface. It is commonly associated with an alkaline water environment of deposition in which the silica network is attacked, enlarging pre-existing cracks.